Since the late Middle Ages, metal has been processed in the Leiningerland, a historic landscape in the northeastern parts of the Palatinate Forest. Today, Drahtzug Stein is located here, one of the world's leading manufacturers of wire solutions. Among its customers are well-known manufacturers in the agriculture, medical, automotive and furniture industries. The hidden champion made it to the top thanks to continuous improvements in production and quality standards. The company's slogan "Innovations in process" not only refers to state-of-the-art technology, but also to the efficient organization of all production, logistics and administration processes. An important milestone was the introduction of the comprehensive ERP solution proALPHA in 1995. Quality and proximity to customers are among the key success factors at Drahtzug Stein. All products, be it simple metal handles or complete dishwasher baskets, have to fulfill the highest quality standards and be delivered quickly to the customers. With factories in Poland, France, Italy and the US, the SME has flexible production capacities and short supply routes. One particularity is the storage situation: since the dishwasher baskets are quite bulky, the factories cannot manage to operate large warehouses. "When they leave production, they are transported directly to our customers' consignment areas, which is why we rely on perfect workflows in all processes," CEO Wolfgang Stein explains. Call sales orders usually have to be handled within two hours, so timing is a crucial factor. This is where the proALPHA Advanced Planning and Scheduling (APS) tool comes into play. It prioritizes work orders, issues warnings in case of bottlenecks and overloads, and suggests alternate resources. 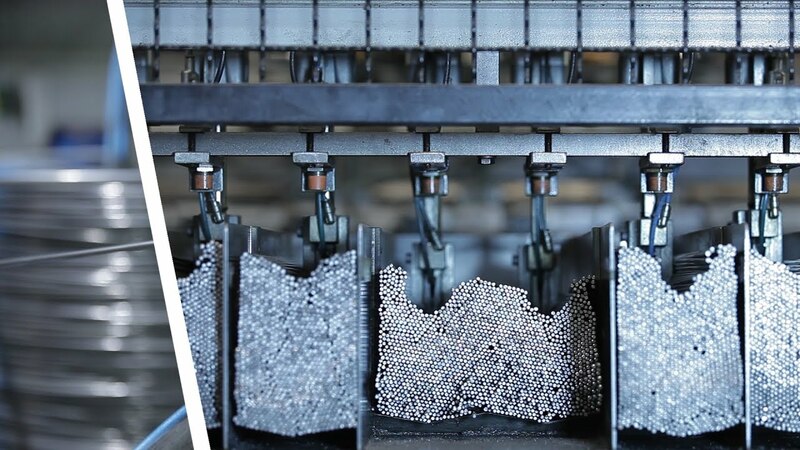 Since the company has to deal with extremely tight deadlines and up to 100,000 plastic-coated wire items every day in Altleiningen alone, the workforce of some 350 employees depends heavily on APS. The many variants of the welded steel wire dishwasher baskets are managed in proALPHA. All required information is made available for the subsequent process, coating, where the wire structures are heated, dipped in a powder bath and then coated with a protective layer. "This allows for optimum capacity planning by the coating division, ensuring smooth processes without any delays," Frank Grimm, head of data processing, explains. With up to 45,000 pieces produced per day, this is a continuous challenge. "To a mid-sized company like us that is growing continuously, proALPHA is probably the best ERP system because it allows us to control all processes with a single solution." Today, the manufacture of tools and prototypes at Drahtzug Stein is controlled by the ERP system. More than 80,000 different products and 40,000 bills of materials have been stored in the database to date. "One of the greatest advantages of proALPHA is its capability to map various production types and terms of delivery," Grimm points out. Some customers work with flexible call sales orders within the context of blanket orders, while others place conventional orders. Since the family-run company independently stocks the warehouses of most of its customers, speed and flexibility play an important role here. Drahtzug Stein almost never knows when which products will drop below the critical threshold. And then they have to be produced and delivered within the shortest possible time. Quite often these orders are not placed electronically but on paper. These documents are often brought along by the drivers, who drive back and forth between the various customer factories and warehouses. This information then has to be entered in the ERP system. Thanks to proALPHA, Drahtzug Stein increased efficiency in other areas, too. For example in document management by means of automatic keyword assignment. Based on defined criteria, the proALPHA DMS module suggests standard descriptions that can be selected manually. For the documents to be archived, the search terms are defined in the system. This avoids errors and speeds up processes. The data processors may also add further keywords. When a shipping document is archived, the supplier number, date and user are automatically suggested. The employee may also assign an internal ID to the document. "Now everyone gets their documents from our electronic archive without further ado," Grimm explains. Response times are significantly reduced, too, because documents are sent to customers and suppliers by e-mail directly from the system. This allows any issues to be resolved quickly with a single phone call supported by the DMS. As an international company, Drahtzug Stein relies on communication with its subsidiaries. With the respective country versions, these are all connected to proALPHA. The data exchange is based on the Intercompany module in a specific pAI format. A number of configured workflows speeds up these processes. All in all, the ERP system now runs on 350 workstations in 5 countries. "When we use software, we expect it to improve our processes. This is exactly what proALPHA does," says Frank Grimm. In purchasing, for example, an authorization logic ensures smooth, standardized order processes. As a result, Drahtzug Stein no longer has to prioritize orders, regardless of whether they involve expensive products or class C goods. The employees responsible process requests using the proALPHA ToDo list. The decision as to whether an order is released for production rarely takes more than half a day from order placement, regardless of the factory's location in the world. One particularity of the sophisticated production planning at Drahtzug Stein is the customer-specific labelling of products. Even during production planning, proALPHA calculates and prints the required number of labels for each order. Many customers want their goods to be already labeled with their corporate logo upon delivery. For example, a shower basket produced for a large furniture store should immediately receive the right labels for the end customer. This way, the hidden champion can increase customer satisfaction and loyalty by optimizing its logistics. "A company like us can be controlled much more effectively with a good ERP system," says CEO Wolfgang Stein. "Especially when it comes to expanding our product range and international growth."